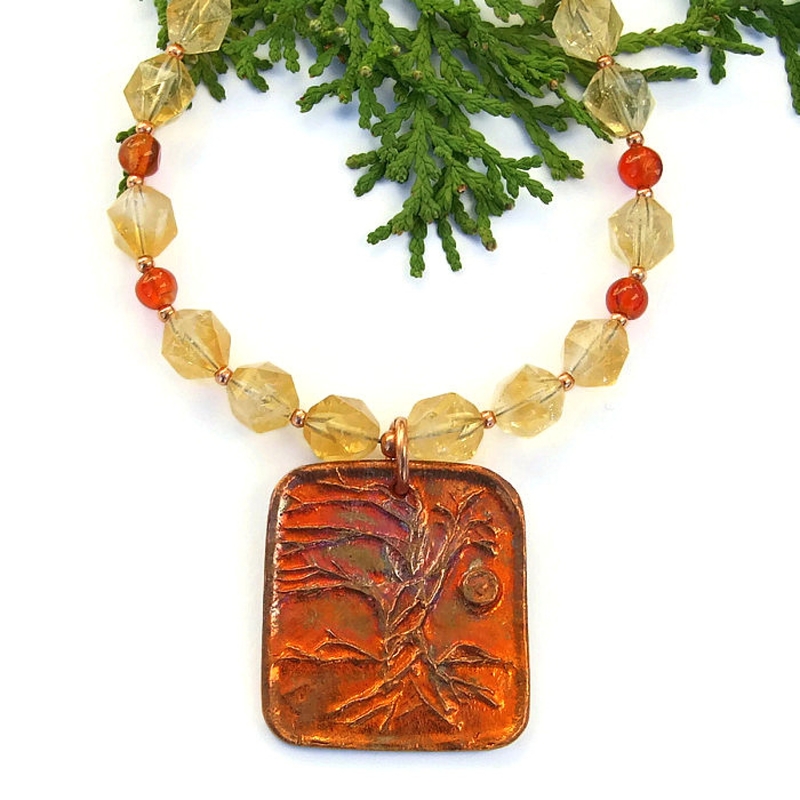 The breathtaking WORLD TREE necklace marries the beauty of a mystical Tree of Life pendant with glorious gemstones. The focal of the one of a kind necklace is a colorful copper pendant that is artisan made and features a raised Tree of Life design with a moon. 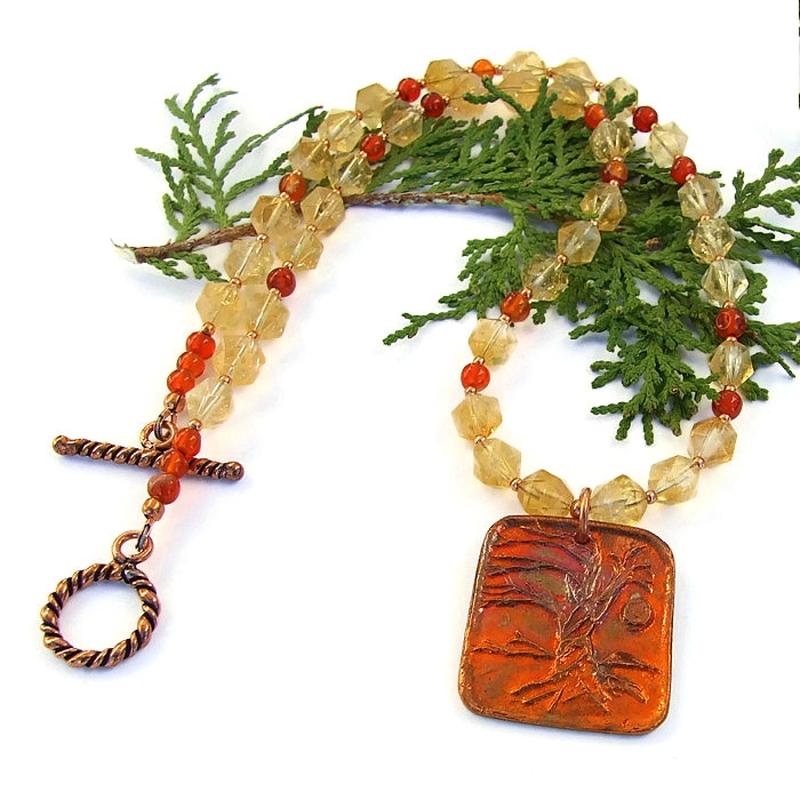 To perfectly complement to the pendant, two types of gemstones were used: sparkling star cut citrine and rich orange carnelian. Small copper beads are scattered throughout the necklace, which is finished with a twisted design copper toggle clasp set. 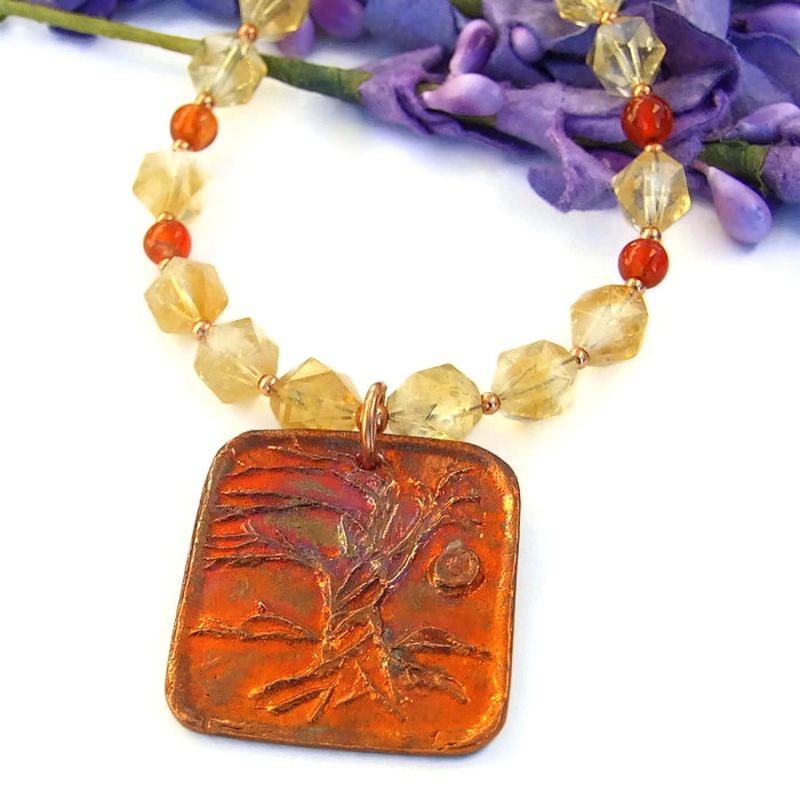 Created for the woman who adores jewelry with the age old symbolism of a Tree of Life / Yggdrasil design, the unique WORLD TREE necklace was carefully designed and handmade by Catherine of Shadow Dog Designs. 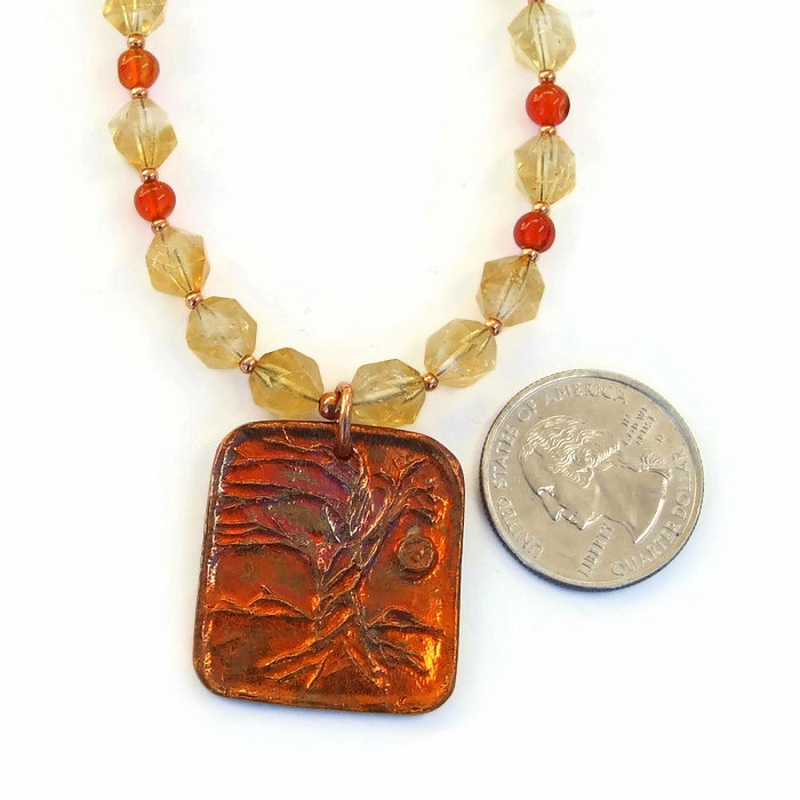 *** For a better understanding of the relative size of the artisan copper tree pendant, citrine and carnelian used to create the WORLD TREE necklace, please be sure to check out photo # 6 for a size comparison with a quarter. Some version of the Tree of Life symbol is found in most cultures worldwide, dating back to ancient times: the Hindu Akshaya Vata; the Egyptians' Holy Sycamore; the Mayan Wacah Chan; the Norse Yggdrasil; and many, many others. All parts of the tree have meaning: the sturdy roots dig deep; the trunk establishes a foundation; the branches reach out for sustenance; the leaves collect strength; and the fruit gives life. A Tree of Life is also said to be the world center, connecting the heavens with the underworld and representing the cycle of life, connecting all forms of life on earth. 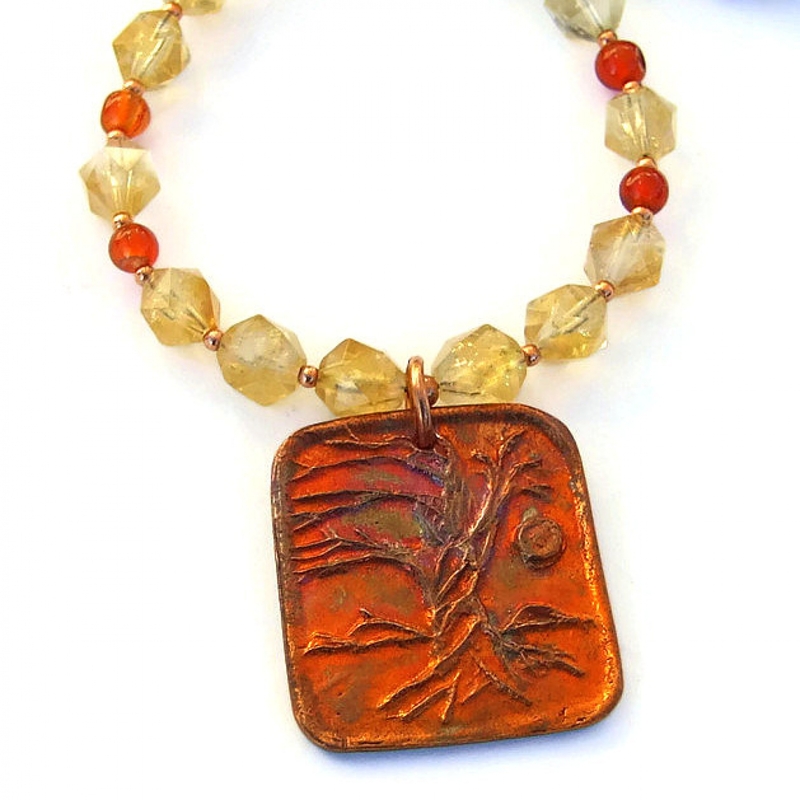 The Tree of Life pendant used in the WORLD TREE necklace is a one of a kind, handmade piece by KiyoiDesign from copper metal clay, an artisan clay. The pendant was designed and hand formed by the artist with a twisted tree, a moon and a border. It was fired at high heat in a kiln where the binder in the clay burned off, leaving a pure copper pendant. Since the tree, moon and border are raised against the background, the pendant has wonderful texture. The pendant was heated again with a torch to bring out the amazing colors that copper is famous for. Besides the natural copper color, you can see purples and fuschias and oranges. The photos of the pendant definitely do not show the real beauty. The back of the pendant is flat as is stamped with the artist’s logo. A heavy duty copper jump ring securely connects the pendant to the main body of the necklace. The shape of the amber yellow citrine is called “star cut.” Each gemstone has fifteen flat faces, each with a peak radiating out into a five-point star. As the necklace is worn, the flat faces sparkle and shine as the angle of the light changes. 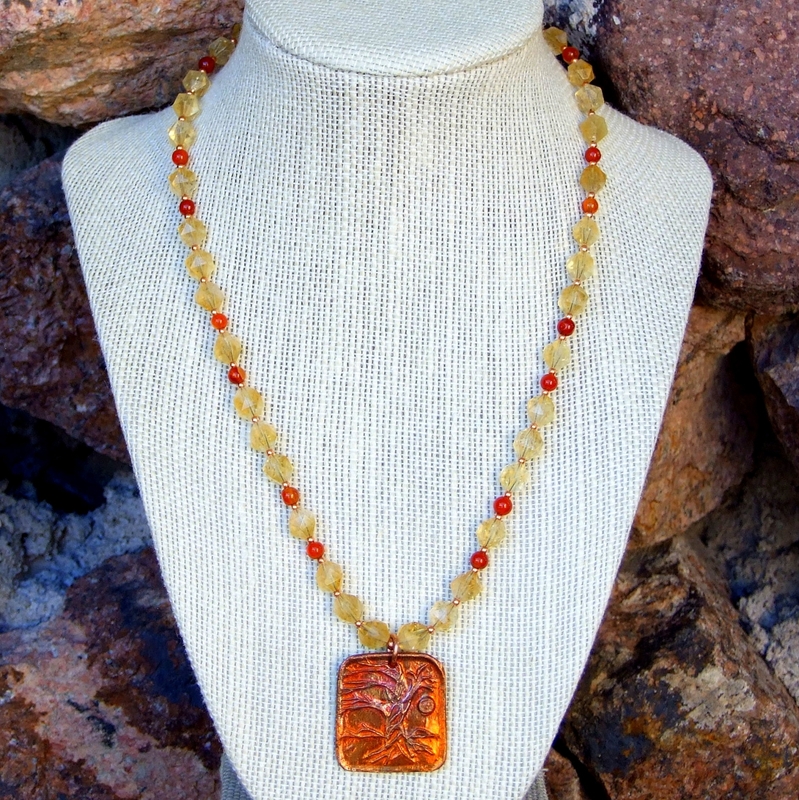 The color of the gemstones range from a pale yellow to a medium amber color. A majority of the gemstones are translucent, although some have natural inclusion that are “foggy” looking. 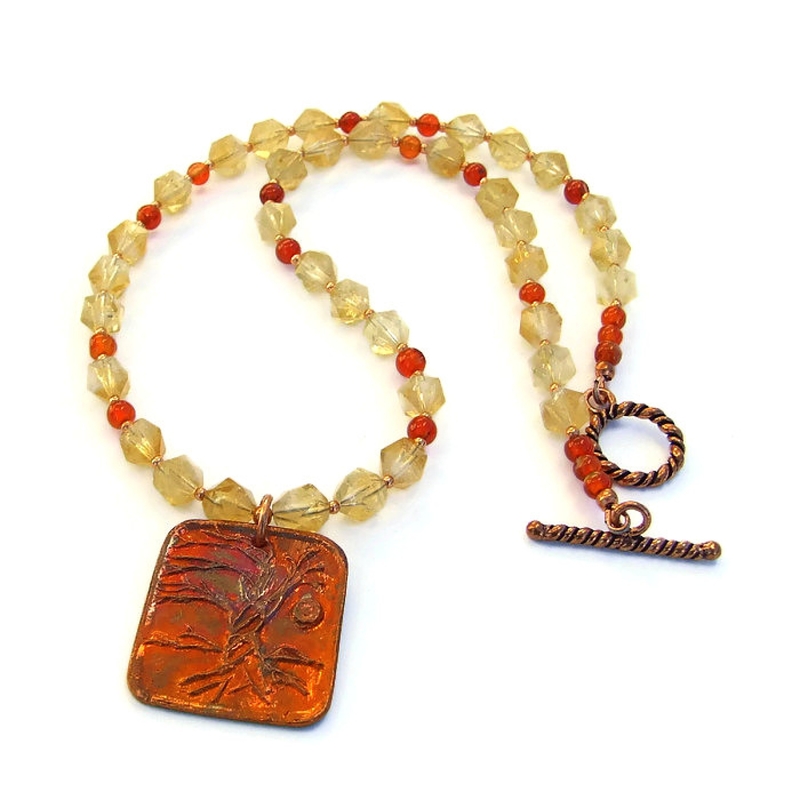 Between each grouping of citrine are natural carnelian rounds, ranging in color from a medium orange to dark orange-brown. 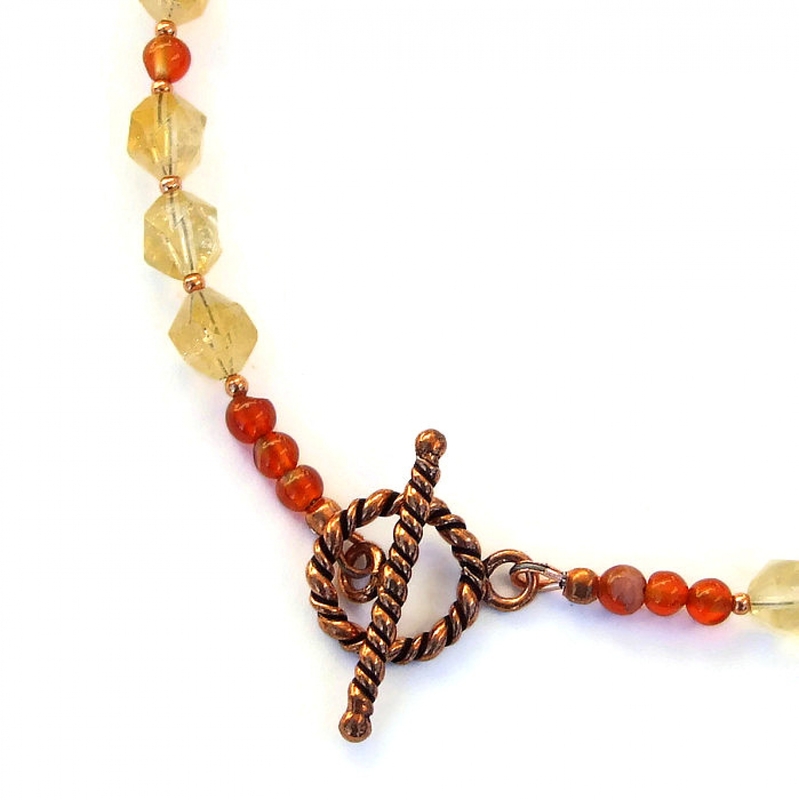 A single small copper bead separates each gemstone from the next, adding a rich copper glow. 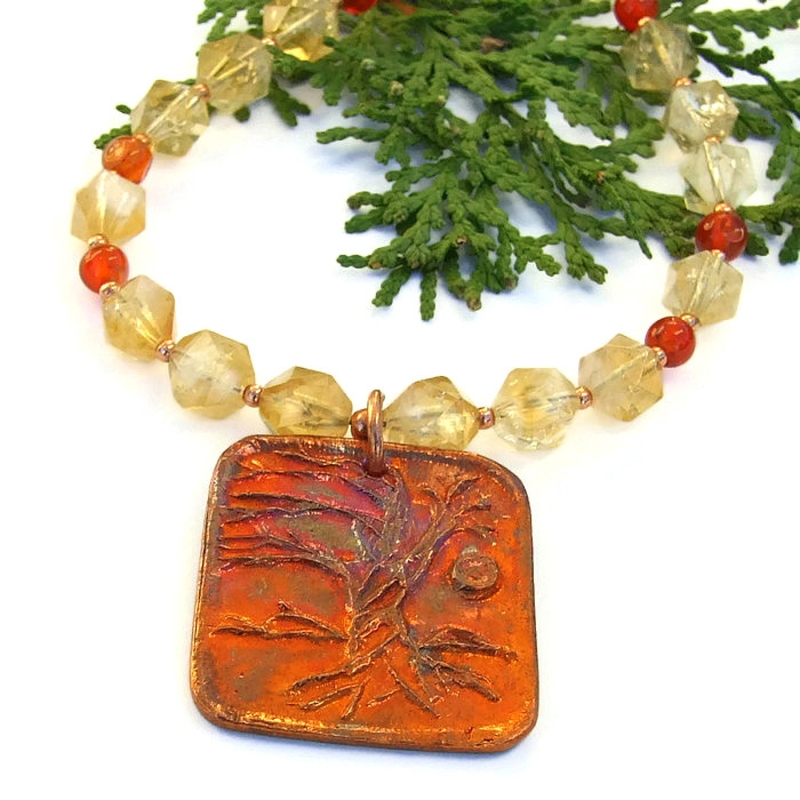 The WORLD TREE necklace is finished with a copper clasp set. The clasp has a twisted design for even more beauty. Since ancient days, trees have always been a symbol of strength and perseverance and the joining the heavens with the underworld. 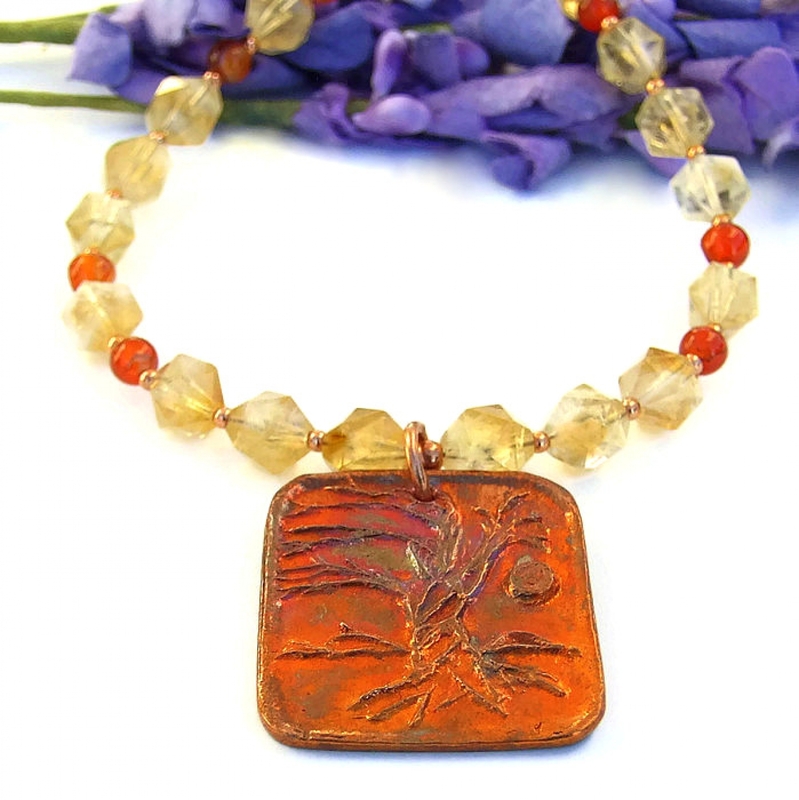 Citrine is said to enhance light-heartedness, joy, happiness, wisdom and peace. 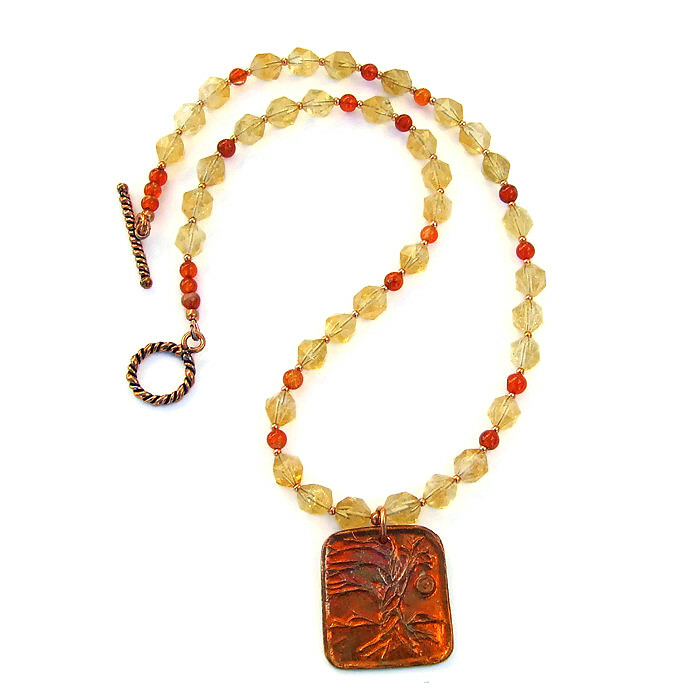 Carnelian is used to aid in understanding the inner self, helping to offset doubt and negativity. Copper is said to allow the wearer to recognize barriers in the path of personal development. 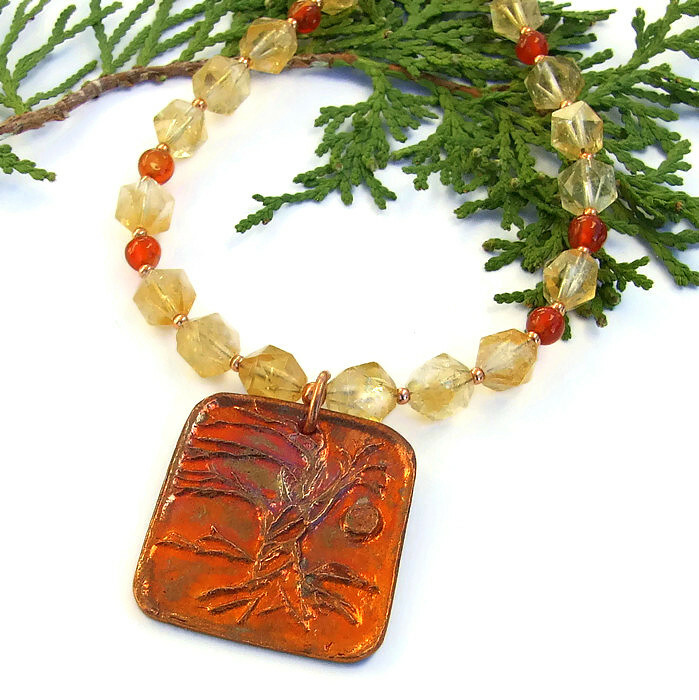 The WORLD TREE artisan necklace was carefully designed and handmade in a dog friendly, smoke free studio. The necklace will come with two informational drop tags: one with the piece's name; the other lists the materials used in the necklace and the language of the stones and metals. It will be carefully packed in an organza jewelry bag, perfect for gift giving to a loved one . . . or to yourself!